American electric car maker Tesla Motors is suing the BBC’s hugely popular Top Gear TV program for libel and malicious falsehood. Tesla is alleging Top Gear rigged a scene in which the all-electric Tesla Roadster is seen to run out of electricity while racing a petrol-powered Lotus. 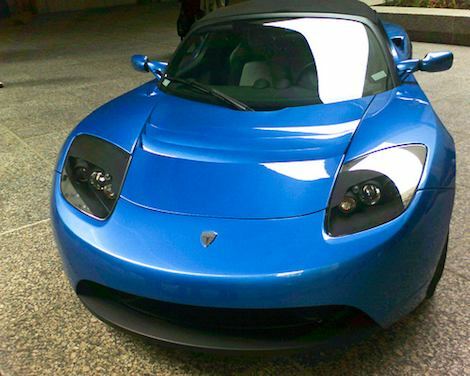 The Tesla Roadster is the world’s fastest production electric car. The offending part of the show can be seen in the embedded video. Tesla is claiming that during the episode Jeremy Clarkson, one of the show’s hosts, falsely claimed that the Tesla ran out of charge after 55 miles and that the brakes apparently broke while it was being charged. During the segment, Clarkson claimed: “Although Tesla say it’ll do 200 miles, we worked out that on our track it would run out after just 55 miles.” In a damning summary, Clarkson also asserts, “In the real world, it doesn’t seem to work”. Do you think this libel claim by Tesla will backfire on the company, given that Top Gear is a very popular show with vehement fans? Would Tesla be better to take it on the chin, accepting that opinionated “petrolheads” (such as the show’s hosts) are never going to give an objective review of an electric sports car, no matter how impressive it may be? Or, is there more at stake here than just one company against a TV show? Is this about proving that even existing electric cars perform better than traditional petrol-powered cars? Clarkson is a climate-change-denying recidivist who uses his popular platforms to undermine the science with constant lies, and I hope Tesla expose him in court. I thought the piece on the show was very positive. Not sure Tesla’s problem, i mean haven’t they seen what Top Gear do to other cars and makers? If that is the case, no doubt that will be revealed. We’ll I guess there’s a lot riding on it – new car company, new electric technology, potentially big market in Europe?